May 1963. Pic courtesy of Mirrorpix. The quietly spoken boy from Shirebrook who became a 1966 World Cup winner; Ray Wilson was highly regarded in the dressing room for his calm demeanour and his refusal to buckle under pressure. Wilson was a visionary full back whose dependable distribution and overlapping runs down the left flank helped make him a Huddersfield and Everton great. He made his debut for Second Division Huddersfield Town, for manager Bill Shankly against Manchester United in 1955. Within two seasons he was an established first team performer. Wilson spent twelve years at Town, making 266 appearances, before signing for Everton in 1964. The £40,000 fee paid was a record for a full-back at the time. Wilson was 29; he later admitted fearing he had waited too long to make the move to top-tier football so late in his career. His fears were unfounded, as he went on to be part of the Everton team that won one of the most dramatic FA Cup finals of all time, turning a two goal deficit to Sheffield Wednesday into a 3-2 victory in 1966. It was to be the first of two successful Wembley finals for him that summer. 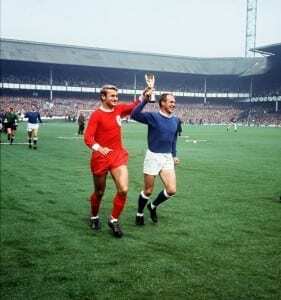 Roger Hunt football player for Liverpool and Ray Wilson of Everton run around Goodison Park displaying the Jules Rimet World Cup 1966. Pic courtesy of Mirrorpix. 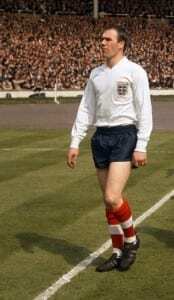 Wilson had been an England regular since 1962, playing in all the team's games in the World Cup in Chile; a feat he would repeat on home soil in 1966, as he was firmly established as Alf Ramsey's first-choice left back. The 1966 World Cup final didn’t start well for Wilson, who headed Siggi Held's cross straight to Helmut Haller who put the ball past England ‘keeper Gordon Banks. Yet Wilson recovered and went on to play a key role. The team went on to win 4-2. Wilson was the oldest member of the side at 31 and appeared in one of the enduring post-match images - Booby Moore being hoisted aloft with the trophy. Wilson missed out on clinching the Division One title (Everton had won it one year prior to him joining, and again one year after he left) and, after playing for England again in the 1968 European Championships, injury began to plight his career in Merseyside. He left for Oldham Athletic in 1969, having played 116 games for the Toffees. Wilson went on to be player-coach at Bradford. Unusually, however, he decided not to stay in the game and instead became an undertaker. Wilson was awarded the MBE for services to football in 2000, alongside the other four members of the 1966 team who had not been honoured: George Cohen; Nobby Stiles; Alan Ball; and Roger Hunt.